KEY FEATURES: Creeping herb (to 30cm high) with opposite, purple leaves (to 8x4cm), puckered upward into ridges or downward into basins, and small white flowers - always sterile. cvs 'Exotica' very puckered into basins. 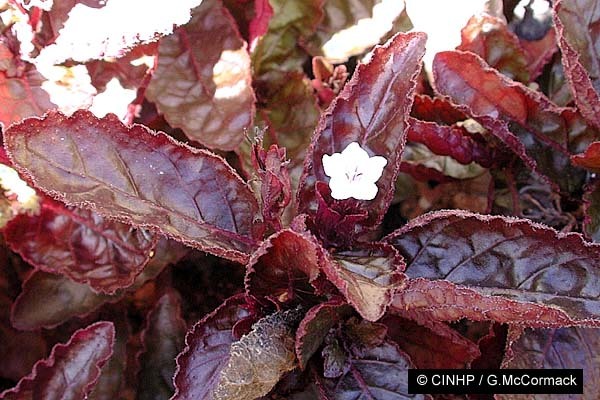 Native of Indonesia (Java), widely used for borders and ground cover. SIMILAR SPECIES: Hemigraphis reptans [presence needs confirmation] leaves green, narrow-oval (vs purple, wide oval to heartlike); corolla yellowish to white to 1cm (vs purple-lined to 1.5cm); fertile (vs sterile); a lawn weed (vs ground cover)..
SYNONYMS: Hemigraphis colorata; Ruellia alternata; Ruellia colorata; Strobilanthes sp. IDENTIFICATION: Low creeping herb, to 30cm. STEMS purple, rooting at joints. LEAVES metallic-purple above, purple below, opposite, wide-oval to heart-shaped, to 8x4cm, surface puckered into ridges between side-veins, teeth round. FLOWERS in 3cm terminal spike; bracts leaf-like, purple, to 1.5cm; calyx purple spines to 1cm; corolla funnel with 5 flared lobes, ~1cm long x 1cmØ, white, thoat with purple stripes; sterile. Cvs 'Exotica' green-purple above, puckered downward into deep basins. Ground cover and borders. 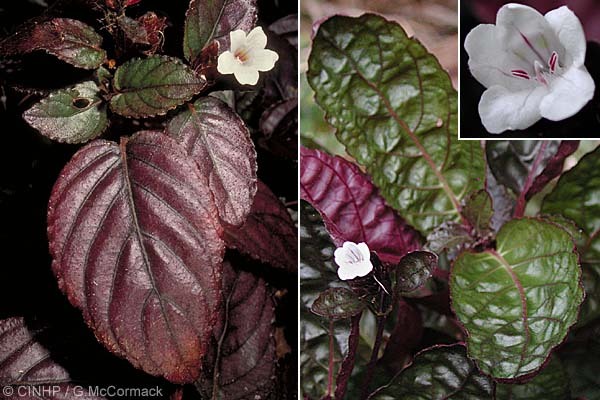 GENERAL NOTE: Burman (1768) noted his Ruellia alternata as being from Java, and the Blume (1826) Ruellia colorata was also from Java. For many years the similarity of the specimens was overlooked. [ACSmith, Fiji flora] The name Ruellia colorata is also sometimes mistakenly applied to Brazil Torch (Ruellia elegans) and Cardinal's Guard (Pachystachys coccinea). [GM 4/2003].